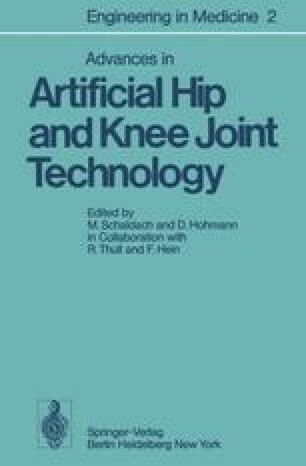 The principle of “low friction arthroplasty”, devised and introduced in 1963 by Charnley (1) and shortly afterwards by Mueller (2), is generally preferred nowadays with total hip endoprostheses. With the polyethylene/metal combination used for the joint socket and the articulating ball, the moment of friction is initially very low. However, owing the wear phenomena on the polyethylene socket (3,4,5,6) — and to a minor extent on the metallic ball as well (7) — a limited service life of the polyethylene socket is to be reckoned with.